The April edition of the IMF’s Global Financial Stability Report makes uncomfortable reading for all of us in Asia. The report ranks regions and sectors according to how vulnerable they are to financial shocks, using a traffic-light system to highlight problematic areas. The number of lights flashing red in Asia suggests now is a good time for Asian policymakers to get their houses in order. There are particular concerns around China. Large, opaque and heavily-indebted off-balance sheet investment vehicles are highlighted as a source of particular vulnerability. Maturity and liquidity mismatches are rife, the balance sheets of small and medium-sized banks are weak and the risk of further policy easing to boost growth without deeper reforms are a cause for concern. These risks aren’t limited to China. Many banks, firms, households and governments in Asia borrowed heavily when interest rates were low and are now feeling pressure as rates increase. Those which borrowed heavily in US dollars are feeling pressure as the US dollar appreciates. Those which borrowed through short-term and portfolio lending to finance longer-term investment are now feeling pressure as financial conditions tighten. The trade war between the United States and China will, hopefully, come to an end in the not-too-distant future. But the full cost of the trade war to Asian supply-chains, flows of trade and investment and the rules-based trading system will continue to be felt long after the ink on any ‘deal’ has dried. The threat of a real trade shock to the economies of the region is high. Policy uncertainty remains a serious threat to Asian stability. Brexit, the deepening globalisation backlash, the possible collapse of the WTO dispute settlement body and questions around US commitment to the global rules-based order, all pose serious risks to Asian countries, many of which grew their economies and reduced poverty on the basis of these systems and institutions. If things go badly, who will Asian policymakers turn to for help? The continued stigma and painful memories of the Asian financial crisis mean few would dare turn to the IMF. Regional mechanisms like the Chang Mai Initiative Multilaterization (CMIM) are untested and potentially unworkable in practice. Regional mechanisms and development banks remain linked to the IMF if any significant financial support is required. Bilateral currency swap lines are often small, patchy and uncertain in Asia and would be of little assistance if a shock was to affect many countries. The message for many is Asia is that, if things go badly, you’re on your own. This message has been received loud and clear by policymakers in Indonesia. The Indonesian parliament passed the Prevention and Resolution of Financial System Crisis Law in 2016 to ensure better cooperation, collaboration and preparation between Indonesia’s regulators and institutions. The objective of the new law is commendable, but it also has serious deficiencies. In this week’s lead essay, Adam Triggs, Febrio Kacaribu and Jiao Wang report on their recent survey of Indonesian officials, regulators, banks and academics which explored how Indonesia would manage a financial crisis. They remind us that, when a financial crisis hits, speed is everything. If authorities are slow to act, liquidity shortages can become solvency crises, banking crises can become currency crises, currency crises can become sovereign debt crises and what started as a financial crisis quickly becomes an economic and political crisis. Staying ahead of the curve, they warn, is critical. Speed and flexibility are the critical ingredients missing from Indonesia’s crisis management framework, and it stands as a warning the rest of the region. ‘A bank suffering a liquidity shortage would ordinarily receive assistance from Bank Indonesia, the central bank’, they note. ‘But under the new law, the remedy is not so simple, particularly given bank bailouts have now been outlawed’. Triggs, Kacaribu and Wang outline the long and bureaucratic process that would need to be followed in the event of a financial shock. The process requires advice to be prepared for a new Crisis Committee by the financial services authority. It requires agreement from multiple regulators before any support is provided. 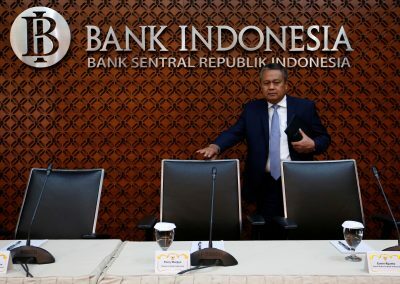 It requires adequate collateral to be provided by the bank requesting assistance and would likely see other Indonesian banks asked to chip-in financial support and, potentially, require political approval from the President of Indonesia. They explain how the law’s motivation dates back to the Indonesian government’s US$700 million bailout of Bank Century in 2008, Indonesia’s then 13th largest bank. Unexpected losses over the bailout of Bank Century led to riots outside parliament and numerous investigations against senior policymakers and officials. This, in turn, has led nervous officials who, facing inadequate legal protection, were moved to create the current law, giving themselves political and institutional cover at the cost of reduced speed and flexibility. For its part, Indonesia in recent times has managed a challenging global environment well. Capital outflows have been relatively low, Indonesia’s stock market has outperformed its peers, growth forecasts are stable, inflation is low, unemployment is below its five-year average and the government budget has improved through a smaller deficit and cheaper borrowing costs. But with risks rising at home and abroad, Indonesia’s crisis management framework, like those in other Asian economies, could be tested sooner rather than later. President Joko Widodo (Jokowi) has comfortably won the recent Presidential election over his more nationalistic rival, former military man and former president Suharto’s son-in-law, Prabowo Subianto. But while Jokowi clinched around 55 per cent of the vote, Indonesia’s election focused more on personalities and political intrigue than the economy. This is a problem. Risks are rising and Indonesia’s new crisis management framework has serious flaws. If Jokowi’s next term as president is to be successful, he’d best fix these deficiencies sooner rather than later. Here are the top stories for Sunday, April 21, 2019 | More than 200 killed in Sri Lanka bombings on Easter; Giuliani says nothing wrong with Russia contacts; Deadly flooding in Canada; Prayers for Notre Dame firefighters.